Update, 5:10 EST: The ING NYC Marathon has been cancelled. Press conference coming soon. Despite much debate, the ING New York City Marathon will go forth as planned this weekend in the aftermath of Hurricane Sandy. With this, even the most basic of marathon preparations can turn into a New York Post story, leaving partners, who have invested millions of dollars and months of time planning, with a delicate last minute decision: alter cheery, well-laid sponsorship activations to reflect the right tone or face a massive PR backlash. At least two ING NYC Marathon partners and the New York Road Runners have announced a donation program to fund relief efforts. NYRR has created the 2012 ING New York City Marathon Race to Recover Fund and will donate at least $1 million, or $26.20 for each of the more than 40,000 runners, while the Rudin Family Foundations yesterday announced a donation of $1.1 million, and race title sponsor ING has pledged $500,000. 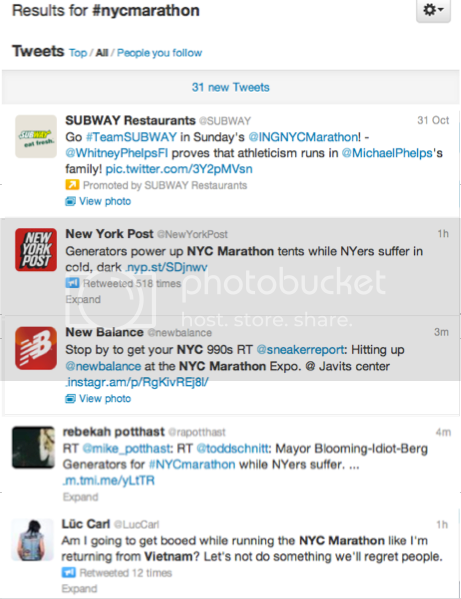 For all the good works, there will no doubt still be awkward moments where activation plans sit next to protests and bad publicity such as these tweets by marathon partners, Subway and New Balance, likely planned well in advance, but placed on either side of the New York Post generator story. Let's hope sponsors can act quickly to alter their activations and do good for not only their brand, but, the city, in a time of need. The Marathon Race to Recover Fund will support a number of charities involved in relief efforts, including the Mayor’s Fund and the American Red Cross. We'll update this blog as other sponsors make announcements. In the meantime, what do you think is the right call for the marathon and its sponsors? Go on as planned or reschedule? Assuming it's going forth, what are the appropriate steps sponsors should take?